New PURELL® Multi Surface Disinfectant, the latest innovation from GOJO, the inventors of PURELL® Hand Sanitizer and a global leader in hygiene solutions, has been named Product of the Year in the Home Cleaning Category. Product of the Year is the world’s largest consumer-voted award for product innovation. 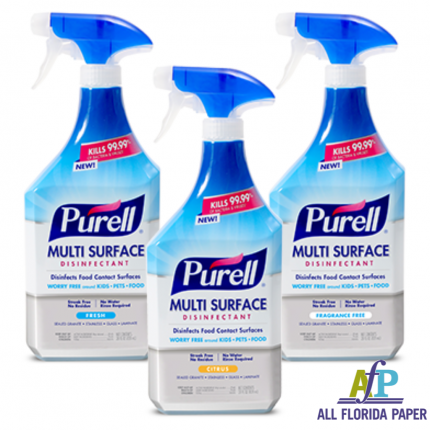 PURELL® Multi Surface Disinfectant, which holds the EPA’s Design for the Environment (DfE) Certification, is a revolutionary alcohol-based, patented formula designed to disinfect and clean both hard and soft surfaces. It rapidly kills 99.9 percent of germs like bleach, but without harsh chemicals and irritating fumes. PURELL® Multi Surface Disinfectant disinfects germs like cold, flu and norovirus in 30 seconds – the fastest overall disinfection times for bacteria and viruses of any other DfE product. Formulated for food-contact surfaces, PURELL® Multi Surface Disinfectant can be sprayed on cutting boards and food-prep surfaces with no rinse required after use. The product can be used for tasks where traditional disinfectants cannot, including sanitizing high chairs; disinfecting pet bowls; sanitizing soft surfaces such as stuffed animals or couch pillows; disinfecting toys and pacifiers; or disinfecting and cleaning the refrigerator when food is nearby. Each year, Product of the Year takes entries from new consumer products launched within the previous year that demonstrate advancement within their industry. Product nominations are placed into categories including beauty, personal care, household essentials, food and beverage, pet care, etc., and are assessed on seven key measures. One product is named the winner of each category, based on the results of the consumer survey. New PURELL® Multi Surface Disinfectant is currently available on Amazon.com, Jet.com and Walmart.com, as well as at H-E-B, Publix, Shoprite and at additional retailers throughout 2018. For where-to-buy information, go to www.PURELL.com/surface.